Latest: Rescuers use crane in Taiwan river to hoist wreckage of plane that crashed . News agencies are now reporting 25 dead. Plane cartwheels into river on take-off. Dramatic footage shows stricken plane's wing clipping motorway. Passengers swim, wade away from submerged wreckage. Thirty-one mainland Chinese among 58 on board. Rescuers used a crane to hoist a wrecked TransAsia Airways plane from a shallow river in Taiwan's capital late Wednesday as they searched into the night for 18 people missing in a crash that killed at least 25 others. Flight 235 with 58 people aboard — most of them travellers from China — banked sharply on its side shortly after takeoff from Taipei, clipped a highway bridge and then careened into the Keelung River. Rescuers in rubber rafts pulled 15 people from the wreckage during daylight. After dark, they brought in the crane, and the death toll was expected to rise once crews were able to search through previously submerged portions of the fuselage, which came to rest a few dozen metres from the shore. 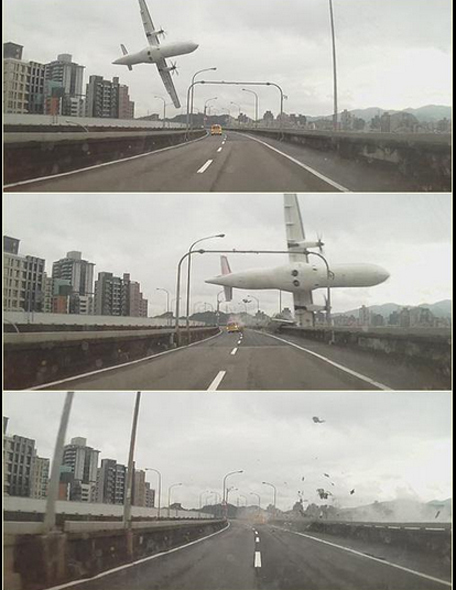 Dramatic video clips apparently taken from cars were posted online and aired by broadcasters, showing the ATR 72 propjet as it pivoted onto its side while zooming toward a traffic bridge over the river. In one of them, the plane rapidly fills the frame as its now-vertical wing scrapes over the road, hitting a vehicle before heading into the river. Speculation cited in local media said the crew may have turned sharply to follow the line of the river to avoid crashing into a high-rise residential area, but Taiwan's aviation authority said it had no evidence of that. Taiwanese broadcasters repeatedly played a recording of the plane's final contact with the control tower in which the crew called out ‘Mayday’ three times. The recording offered no direct clues as to why the plane was in distress. It was the airline's second French-Italian-built ATR 72 to crash in the past year. Wednesday's flight had taken off at 11:53 a.m. from Taipei's downtown Sungshan Airport en route to the outlying Taiwanese-controlled Kinmen islands. The crew issued the mayday call shortly after takeoff, Taiwanese civil aviation authorities said. TransAsia director Peter Chen said contact with the plane was lost four minutes after takeoff. He said weather conditions were suitable for flying and the cause of the accident was unknown. Wu Jun-hong, a Taipei Fire Department official who was coordinating the rescue, said the missing people were either still in the fuselage or had perhaps been pulled down the river. Rescuers could be seen pulling luggage from an open plane door to clear the fuselage. Ten inflatable dinghies also searched for the missing. Taiwan's Ministry of National Defence said it had sent 165 people and eight boats to the riverside rescue scene, joining fire department rescue crews. Greg Waldron, Asia managing editor at ‘Flightglobal’ magazine in Singapore, said the ATR 72-600 is the latest iteration of one of the most popular turboprop planes in the world, particularly favored for regional short-hop flights in Asia. At least 25 people were killed Wednesday when a turboprop passenger plane operated by TransAsia Airways clipped an overpass and plunged into a river in Taiwan, in the airline's second crash in just seven months. Desperate crew shouted "Mayday! Mayday! Engine flameout!" according to a recording thought to be the final message from the cockpit to the control tower played on local television. A ‘flameout’ is when the flame that normally burns in the engine goes out, causing engine failure. Twin-engined planes are usually able to fly on one engine. Aviation officials said they had not released the cockpit recording, suggesting that it may have come from amateurs monitoring the radio. Dramatic amateur video footage showed the TransAsia ATR 72-600 hit an elevated road as it banked side-long towards the water, leaving a trail of debris including a smashed taxi. "I saw a taxi, probably just metres ahead of me, being hit by one wing of the plane. The plane was huge and really close to me. I'm still trembling," one witness told TVBS news channel. Rescue officials said that 15 survivors had been pulled out of the wreckage, but that 22 people were believed dead and 21 were still missing. Many of those on board were Chinese tourists. Wednesday's accident happened just before 11:00 am (0300 GMT), shortly after Flight GE235 left Songshan airport in northern Taipei en route to the island of Kinmen with 58 people on board, including five crew members. Six airline officials including chief executive Peter Chen bowed in apology at a televised press conference. "We would like to convey our apologies to the families (of the victims) and we'd also like to voice huge thanks to rescuers who have been racing against time," said Chen, confirming that 13 people had been killed. Lin Kuan-cheng from the National Fire Agency later said that 13 people were dead and nine showing ‘no signs of life’ -- the term used before death is officially confirmed. Those missing are thought to be trapped inside the submerged front section of the plane. "The focus of our work is to try to use cranes to lift the front part of the wreckage, which is submerged under the water and is where most of the other passengers are feared trapped," a senior rescue official told reporters at the scene. There has been no official comment on the cause of the crash, but the black boxes have been retrieved. Several former pilots told local media that the plane's sideways flip while in the air could have been caused by the failure of one of the engines. As time ticked away for those inside the fuselage, rescue boats surrounded the wreckage which remains in the middle of the river, with 400 soldiers drafted in to help. Emergency crews standing on sections of wreckage tried to pull passengers out of the plane with ropes. Those who were rescued were put in dinghies and taken to the shore. As night fell, lighting equipment was brought in and a floating bridge would be put up, officials said. China's ‘Xiamen Daily’ said on its social media account that the 31 mainlanders on board were part of two tour groups from the eastern Chinese city. An employee of one of the tour agencies, surnamed Wen, told AFP that it had 15 clients onboard, including three children under 10 and a tour leader. "It's an emergency," she said. "We're working with different work teams. We're trying to arrange for the relatives to go to Taiwan." TransAsia's Chen said that of the 31 passengers from the mainland, three were children. The rest of the passengers and crew were Taiwanese, according to the airline. The airline said they had received the plane in April last year and it was the newest model of the ATR. A TransAsia plane carrying 58 passengers and crew crashed into a river in downtown Taipei shortly after take-off, Taiwan's fire department said on Wednesday. Of the 58 on board, 28 were rescued, the fire department said in a text message. At least 22 people are said to have died..
Rescuers scrambled to reach around 30 people trapped in the wreckage of a passenger plane which clipped a road bridge and plunged into a river outside Taiwan's capital Wednesday, leaving at least 11 feared dead.